From my sister Sandy – I slightly tweaked her recipe. Everyone gobbles them up. The trick is to use very thin slices of pork loin. *If your local grocer doesn’t carry Goya products, then by all means substitute flour for the Adobo, and about 2 Tbsp. McCormick’s (or another brand) seasoned salt for the Sazon. The taste won’t be exact, but it’ll still be delicious in it’s own way. Heat oil in a large skillet on med-high. 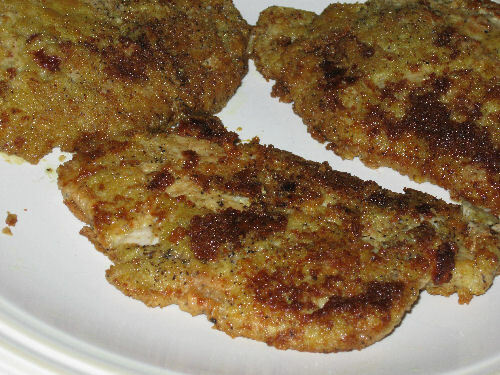 Meanwhile, rinse & pat dry the cutlets & set aside. Place the seasonings in something like a pie plate, mix together with a fork, dredge each cutlet, gently shake off excess, then place in the sizzling oil. Repeat with about 3 cutlets. Cook about 5 minutes on each side, or until done, then place on a cookie sheet lined with paper towels or brown paper bags. Serve.